Last week it was a big day for all the rockers in Transylvania (and also for quite a lot of people from abroad): Iron Maiden held it’s first concert in Transylvania. The event was organized by the owner of one of the local football clubs (CFR Cluj) in order to celebrate their victory in the national first league and getting into Champions League (actually this tiny little marketing trick could deserve a post of it’s own, but I do not want to get into details about that…). Ssso, what happens when a heavy-weight rock band gets into the city? All the roads get crowded! Cluj was not an exception: half of the four lane road leading into the city was closed for all the fans, and so all cars (and late fans coming by car) who wanted to get into the city kindof got stuck on two lanes. Now generally these two lanes (one lane + one emergency lane) tend to get crowded with or without a concert… this time it was a mega blockade: some say the car queue reached the next town to the west, Huedin (surely exagerating, but one gets the idea:BIG JAM). Anyway, I am not really a rock fan, and I only know one song from Iron Maiden (I like that though), so I decided not to get to the concert. Instead we went to visit some artificial lakes just west to the city. Our way home happened to be on the exact same road which had the blockade. Well, I thought it can’t be that bad… YES it can, as I later realized, that we’ve been inching forward for almost half an hour and we did not even reach the city limits (we were stuck on the outskirts of Floresti). 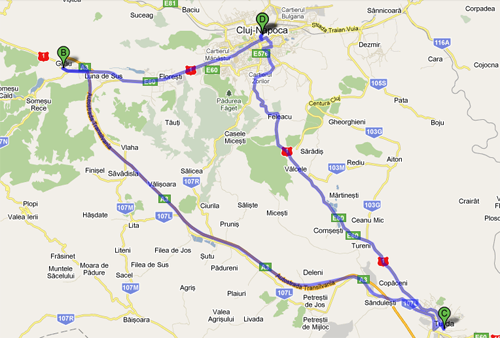 That is when I realized, Cluj recently received a great road which diverts traffic from the city: the A3 highway. The road to the highway was clear, so I turned around, went a few hundred meters back to the node and headed south right to the next city (Turda). From there is another four lane road (E60) leading back to Cluj from the south. This road only had the usual light traffic (for a four lane road), so with a huge detour, but in under an hour we got home.